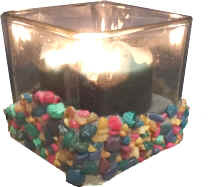 a small glass container—candleholder or jar, multi-colored aquarium gravel, clear silicone, and a votive candle. What You Do: Use a permanent marker to write your name on the bottom of the container. Apply a layer of clear silicone to outside of glass container, you do not need to cover it completely—halfway up the container in a wavy pattern is visually interesting. Pour aquarium gravel over silicone. (Place a tray under the container as you pour the gravel to catch the overflow.) Firmly press the gravel into the silicone. Press more gravel into the areas that need filling. Allow to dry. Place votive candle in the container. Let your light shine! Lighting the candle requires adult supervision. Keep ideas like this coming! $3.00 is the suggested donation for use of this craft idea or become a yearly Support Partner for $12 a year. Click here to learn more. Tell your friends about this craft idea. Invite them to visit SundaySchoolNetwork.Com.